ATF-α is superior in oxidation stability, resistant to heat and temperature change, and has stable frictional properties. In addition, it prevents foaming, which causes power transmission to become inefficient, and reduces vibration at low speed (durability of judder prevention). Therefore, ATF-α can be recommended for your AT/CVT cars. Also, it can be used as power-steering fluid (for Japanese cars). ■High performance and suitable for various cars. As the structure of AT/CVT becomes more complicated and the usage period of cars becomes longer, ATF/CVTF is exposed to tougher conditions. ATF-α WIDE 3-D have stable frictional properties and superior in oxidation stability. In addition, they are superior in durability of judder prevention required for a slip lock-up system. 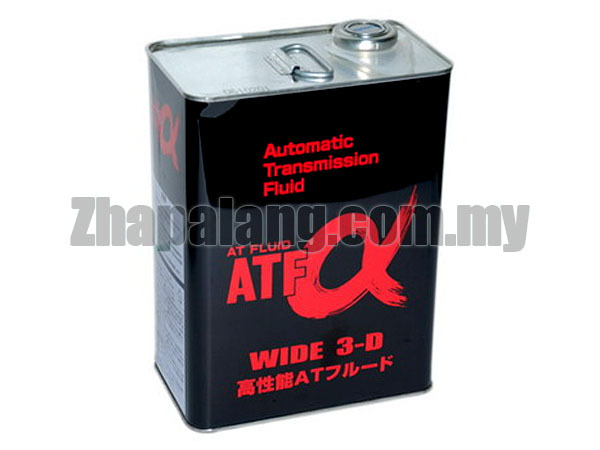 ATF-α WIDE 3-D can be used for various cars, so they are suitable as a unifying fluid or reserve fluid for regular maintenance. Notes : The recommended replacement interval for ATF/CVTF should be every two years or 20,000 km or less.